Time Home Entertainment Inc. and the editors of TIME For Kids bring children—and adults—a book that contains hundreds of answers to questions kids commonly ask about the world around them, but adults can’t always answer. · Animals – What is a Kookaburra? · Space – What is a Solar Eclipse? · The Human Body – What is Dyslexia? · Weather & Climate – What is the Driest Place on Earth? · Food – What is Poutine? · Survival – What If You Come Across a Snake? · Sports – What is the World’s Most Popular Sport? · History – What is a Ghost Town? · Holidays & Festivals – What is Mardi Gras? · Mysteries – What Was the Roanoke Colony? · Inventions – What is a Boomerang and How Can You Make Your Own? · The Future – What Will We Be Eating for Dinner? 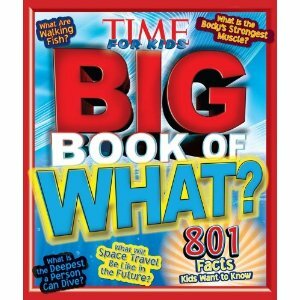 TIME For Kids’ BIG Book of What? is a must-have book to satisfy the most curious of kids. Review: The true test of a book at our house it how my children receive it. My oldest son, 7, took the book around with him every where for a good week reading aloud form its pages. We learned about holidays in different countries, what an adam’s apple is, and customs around the world. Then I founds him making paper boomerangs from instructions within and eventually he even cooked up some pudding pops all on his won. The Big Book of What kept him highly entertained with full page photos and how-to’s. I would recommend it for children ages 6-12 and give it a full five stars for making a reluctant reader one happy camper!